Last weekend Shoshana was babysitting for friends of mine who were kind enough to send home a care package. It was a delicious banana cream pie with a chocolate crust. I savored every bite. I found it unusual that the bananas sat directly on the crust. Desserts I have had in the past, that were similar to this one, always had the bananas on a pastry cream of some kind. I also loved that the topping was made with mascarpone, another twist on desserts of days gone by. I made my version of the pie for friends and realized, very quickly, that the crust was too thick. My first clue was that it was difficult to cut; the second clue came when a girlfriend used her fork to pick up a piece and the chocolate crust went flying. It became obvious that another pie was in the making; yet, it was feedback from friends that resulted in my changing the primary ingredient from bananas to strawberries. One friend does not love bananas in her dessert, but even those who do enjoy them voted for strawberries as a better option. So back to the drawing board, which is more commonly known as my kitchen, I went. I halved the crust and sliced strawberries instead of bananas. To quote one of my friends who tried both versions, “OMG!!!!!! Perfection!” That sums up this Strawberry Cream Pie beautifully. Preheat oven to 350°. Set aside 9” pie plate. Place cookies and sugar into a food processor fitted with metal blade. Process until it is the consistency of fine crumbs. Add melted butter and pulse on/off until well blended. Transfer crumbs to 9” pie plate. Bake for 8 minutes and cool completely before filling. Wash, hull and slice the berries. Dry completely in paper towels. Prepare the filling while the berries dry. Place the mascarpone, cream, sugar and vanilla into mixing bowl. Beat until stiff peaks form. Place the berries evenly over the crust. Use a spatula to transfer the beaten cream onto the center of the berries. Use a small metal spatula to evenly spread the cream layer. Dust cocoa over the top and refrigerate until serving. Strawberry Cream Pie is best when eaten within 2 days. Additional time is needed to cool the crust. this one for Sara…she’ll love it! 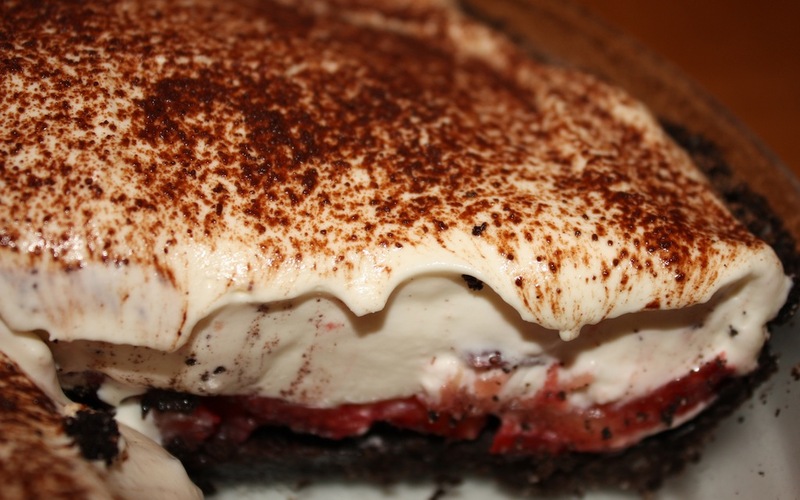 I am sure that Sara will appreciate your making this Strawberry Cream Pie. Can’t wait to hear what she thinks. I have made a pie very similar but used Oreo cookies and lessbutter without the added sugar…turned out great..will try this recipe! I never thought to try Oreo cookies with strawberries. Sounds delightful.